Check out My Friend Huggles in a New York Toy Fair highlights video! Come visit My Friend Huggles at the 2013 New York Toy Fair! Come visit My Friend Huggles at The Atlanta International Gift & Home Furnishings Market! Come visit My Friend Huggles at the Philadelphia Gift Show! 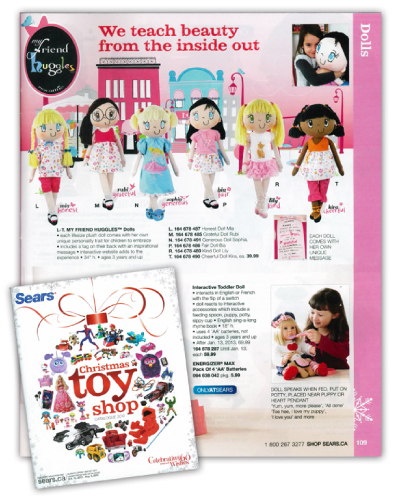 My Friend Huggles Dolls in the Sears Christmas Toy Shop Catalog! My Friend Huggles Dolls picked for Today’s Parent Magazine Top Toys! Another exciting announcement! My Friend Huggles are listed in the prestigious group of top toys for this holiday season. Featured in the November issue of Today’s Parent toy guide edition, The Canadian parent magazine offers some of the coolest and most wanted toys around. As the top parent magazine in Canada their toy guide is the most sold out issue of the year. Go Huggles! Great Divide Corp is thrilled to announce that My Friend Huggles dolls have been awarded the PTPA Winner’s Seal of Approval. 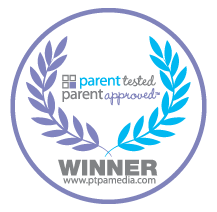 PTPA Media has North America’s largest volunteer parent testing community, with over 40,000 parents and was rated the Most Trusted Seal by 22,000 parents. My Friend Huggles™ dolls won “Toy Of The Year”, Dodo-to-go won “Kid Product Of The Year” and Activity Blanket won“Seal Of Excellence” awards respectively, prestigiously given by Creative Child Magazine. 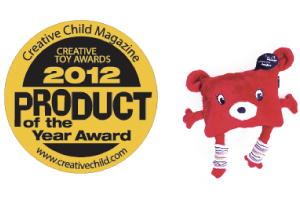 “We are honored and excited that My Friend Huggles Dolls has received the prestigious 2012 Top Toy of the Year Award from Creative Child Magazine. To be recognized by such an esteemed organization will help us raise awareness for both our product and the cause we support of anti-bullying.” says creator Brenda Katz. Creative Toy Awards 2012 Top Toy Award – My Friend Huggles doll collection. Made of soft material, these plush life-sized dolls will be your child’s favorite friend to hug and snuggle. 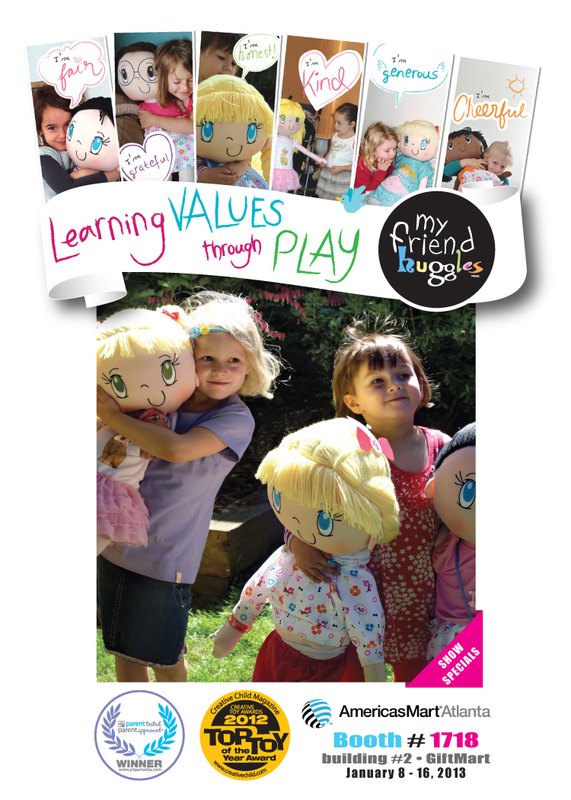 Each doll teaches an important virtue, inspiring positive behaviour and friendships. Creative Toy Awards 2012 Product of the Year Award – My Friend Huggles DoDo Blankets. Toy storage pouch, pillow and blanket all-in-one! This gorgeous 2pc set includes: 1 super-soft blanket + 1 adorable zippered pouch for easy storage. 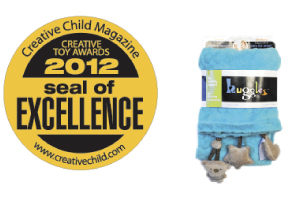 Creative Toy Awards 2012 Seal of Excellence Award – My Friend Huggles Activity Blankie On-The-Go. This super snuggly soft blanket has 3 fun toys attached: plush bear, star rattle and squeaky moon and is perfect for cozying up and entertaining your little one. Direct from Market: Toy Fair 2012 – Doll-licious! 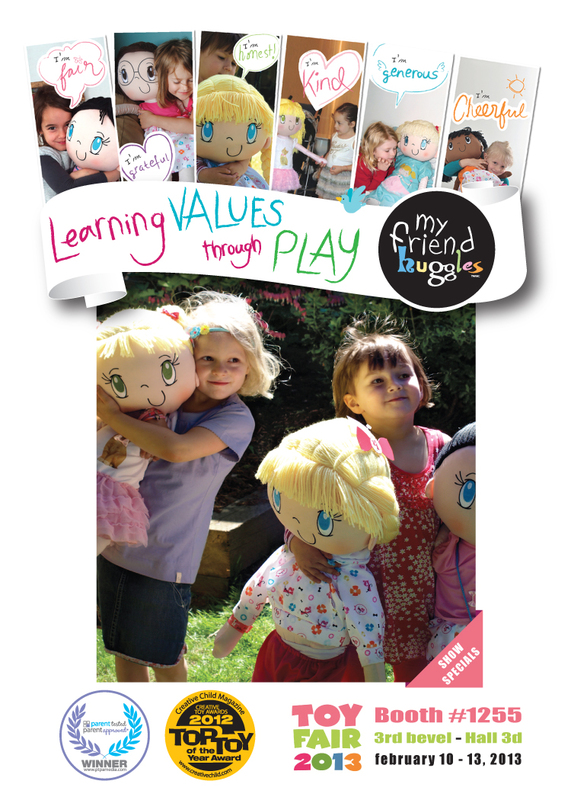 My Friend Huggles, a new line of character-building cloth dolls, made its debut.